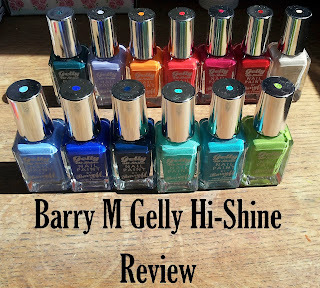 So I’ve been slowly but surely building up my collection of the Barry M Gelly Hi-Shines, I’ve ended up with 13 out of the 18, so I thought it might be useful to share my thoughts and some swatches! So below are the swatches. 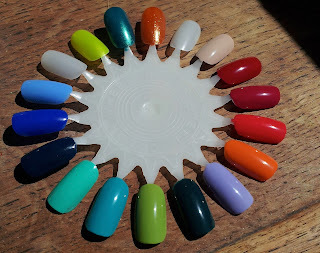 I will list the colours left to right (ignore the 3 colours neon yellow, metallic green & glittery orange – I just didn’t want to waste the nails and I stupidly forgot to take a picture before swatching the StarGazer polishes). Blueberry, Blue Grape, Blackberry, Greenberry, Guava, Key Lime, Watermelon, Prickly Pear, Mango, Passion Fruit, Pomegranate, Blood Orange, Lychee. These are all two coats. The one coat wonders are, Greenberry, Blackberry, Watermelon and Pomegranate. A single thick coat will give you a lovely opaque colour with these polishes. The rest do require two coats. The polishes that are a bit streaky are, Blue Grape – almost requires 3 coats, Guava – only slightly, Key Lime – a bit difficult to apply and 2 coats needed to even the colour out, Pickly Pear – only slightly, Mango – two coats definitely. These last well for me, so 3 days normally before chipping. My day job involves pulling batteries and sim cards from phones so my poor nails take a fair amount of abuse. I know some people get about 5 days without chipping, so if your nails don’t take the same abuse as mine, these polishes will last longer! I’m generally a massive fan of Barry M polishes and these I love even more. I have worn them with a top coat and without and to be honest you can easily get away with wearing them, minus the top coat. They’re super shiny and don’t chip easily. If you follow me on instagram you would have no doubt seen these polishes make numerous appearances! They’re great for mixing and matching, I tend to do polka dots with Lychee mainly, or it could be used as a base for polka dots! These retail for £2.99 and can be found at boots, superdrug or the Barry M website. 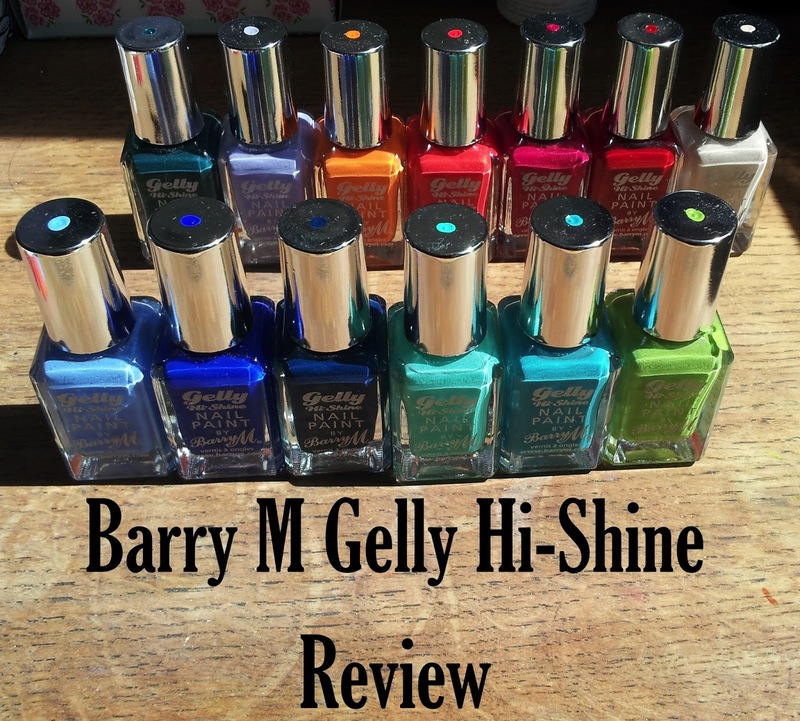 I have my eye on one or two other shades in the collection but I’m not rushing out to buy them as my current nail varnish collection is big enough! Plus I’m still on my spending ban. If you’d like to watch me chat about these polishes check out the video below.